There is absolutely no doubt that so many aspects of our society have benefitted from the contributions of some very successful professional and committed women. Many of these stories have been told elsewhere. What this book does is to join the dots on these contributions at various levels of government, business, the community and academia. For that this book is very welcome. The author spends quite a bit of the book dipping in and out of the issues and debates around why it is important that urban issues need to be addressed. The book seems to be doing several things: Providing information on the contribution by women to our lives and our cities, highlighting the issues around urban development and cities, as well as framing all of this within several stages of the author’s own story. The author has attempted to mesh these three themes together throughout the book. The result is a confusing structure. The book would have benefitted from a very strong editor who was prepared to guide the author to rework the information, structure it differently and maybe reduce the amount of her own historic information. 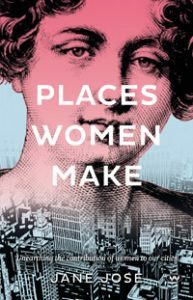 In reference to the secondary tile – Unearthing the contribution of women to our cities – I know that discovery is always a seller for books, but in this case much of the information and arguments are well covered elsewhere. There is little new here, little that has been unearthed, more that it has been consolidated in the context of the author’s own CV and the context of why attention to urban issues remains important for our health, wellbeing and enjoyment. There is much to be positive about in this book especially given that, despite years of advocacy, for most women their contributions to our society remain in the shadows of the dominant boys’ clubs – in their various guises. What the book avoids mentioning is that women have often chosen to seek success through adopting some of the questionable methods of those who they are challenging – the dominant males. Not all women professionals are so friendly or accepting of different views as made out by the author. I could name a few nasty types- and several within the area of interest of this book. The book has not provided recognition of the enormous number of women who have contributed through being dedicated volunteers, part time workers and mostly underpaid workers in so many community, social welfare and cultural organisations. I know of several cases whereby women have contributed to urban and city issues as much as their male conterparts and yet it is the males who have the honours within the record books . It would have been good if the author had at least shone the lights in this direction. I would give it top marks for the main topic she set out to cover – how Australian women’s contributions are important and that they need to be celebrated. It would be hard to recommend this book to people in the professions dealing with urban and city issues within Australia as most of what the author addresses would be well known to them. Hopefully Places Women Make will inspire other women to become aware that more of the doors are opening and it is time for more Australian women to take up that challenge and to pursue a different approach to those of the still dominant boys’ clubs. Given that equity is yet to be seriously addressed within the Australian workforces, this book is a timely the celebration of achievements to date. Society awaits the changes that are overdue.